Last year around this time of year, I stumbled across an event that intrigued me. The idea of taking the Cars and Coffee concept and adding an additional element to it in the form of rotor propelled flying machines. While it does not necessarily seem to make a ton of sense at first glance, the event has been a huge hit. Held each year at the Plymouth Municipal Airport, Cars and Copters has brought together car, motorcycle, and helicopter enthusiasts into one massive gathering where everyone can appreciate all manners of mechanical excellence. The crowd was so overwhelming that when I arrived in Plymouth around 10:45, it literally took over an hour to get into the event. Once inside, however, there are cars lined up as far as the eye can see. And if you grow bored of the cars, hop in line and go for a helicopter ride to change it up. As I was uncertain that I would have the opportunity to attend this event in the future, and having missed it last year, I knew that I wanted to make sure to go this year. It is certainly worth experiencing at least once and definitely brings out an impressive array of fellow enthusiasts. Plus the event benefits a good cause as the recommended donation goes to the Dana-Farber Cancer Center. For more info on the event, go to http://www.carsandcopters.com/. Click through for the videos and photos I took at the event as well as on my way down to the event. Update: See how the Jaguar performed in a head-to-head comparison against the standard setting Porsche Boxster S.
Sometimes, things just come together. For a wedding, for instance, there are so many moving pieces that all must come together and fall into place in order for the day to be perfect. Dresses must look perfect, tuxes must be pressed, the caterer must deliver great food, the DJ must set the perfect atmosphere, and even those things that one cannot control, such as the weather, must all align. When everything is just right, it feels like a miracle and the day comes out elegant, beautiful, and memorable. With this newest entry into the convertible category, Jaguar may very well have pulled off just such a miracle. There is just so much to enjoy in this car that you most likely will not car that it is not quite flawless. The subcompact car has made quite a boom in the last few years. With ever rising gas prices making it impractical to plod around town in a giant SUV, many car buyers looking for their first car want something that offers the space of an SUV, but the efficiency of a small car. Subcompact hatchbacks are designed to offer the best of both worlds, with cargo space that rivals some small SUVs, and small, fuel efficient engines. Of the five we tested though, which one offers the best bang for the buck? Read on to find out! *Starting with this comparison, standings will be determined with a point system. Each category will have a maximum of five points, with 1st place receiving five points, 2nd receiving four points, 3rd receiving three, 4th receiving two, and 5th receiving one. In recent months, I have been doing a lot of reading and watching a lot of videos about interactions between cyclists and motorists all over the world. In many instances, there is a lot of loud screaming and foul language, although mostly it comes from the commenters. Worst of all, the screaming and yelling is frequently the result of misunderstanding and myths about the rules of the road and of cyclists. In a, perhaps misguided, attempt to dispel some of the myths, I have chosen three of the most popular myths to try to set the record straight. Update: See how the Versa Note performed against the competition in our Subcompact Showdown. 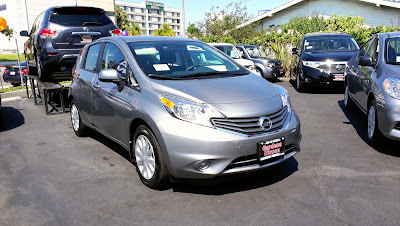 I admit, I was never a fan of the Nissan Versa. Though I have never actually driven one, I have always found the car to look incredibly dull. Finding them all over rental car lots made me want to drive one less since it was pretty clear that the Versa had been relegated to el cheapo rental car status. Now that the Versa has been completely redesigned, Nissan has been working hard to shed the old Versa's "rental car regular" image by giving the hatchback version an additional name, as well as marketing it as a hip and fun vehicle. Marketing gimmicks aside, can the Versa Note change my opinion of the Versa name, and become a car my fiancee would have considered had it been around over two years ago? Update: See how the Sonic performed against the competition in our Subcompact Showdown. Just as with Ford's products of old, I was never a fan of General Motors products, with the lone exception of the Corvette. But also just like Ford, General Motors has made a marked improvement over the last few years with their vehicles. Quality and reliability, two of GM's biggest complaints, have improved to the point that the automotive press actually considers some of GM's current crop of vehicles genuine competitors to their Japanese and German counterparts. GM, like many automotive manufacturers, have recently begun introducing subcompact cars into their vehicle line ups. Subcompacts are becoming especially popular amongst young adults and small families looking for a practical vehicle that does not drink gasoline like an SUV. 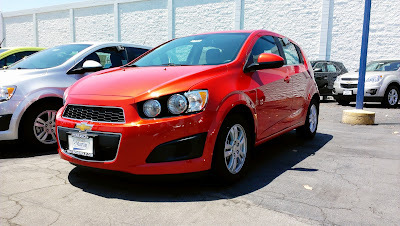 The Sonic, Chevrolet's entry to United States subcompact market, replaces the aging Chevrolet Aveo as Chevrolet's subcompact entry (the Sonic is, however, still marketed as the Chevrolet Aveo in other markets). Competition in the subcompact segment has gotten much more aggressive over the past few years, especially with constantly rising gas prices. Does the Chevrolet Sonic have what it takes to be a true competitor in the subcompact market, or will it crumble under the weight of its competitors? A while back, I shared my thoughts on why I ride a motorcycle. For me, it is a part of my life that I embrace and enjoy. Getting to this point meant a lot of lessons learned and I wanted to share some of those lessons to help others who are interested in getting into motorcycling. Keep in mind that I am certainly no professional rider, just an enthusiast who loves to ride, but I hope some of the lessons I learned along the way can help others avoid making the same mistakes. Lots of people have different ideas about how to approach learning to ride a motorcycle. Some people believe in the "throw you in the deep end" philosophy, which pretty much entails hopping onto a bike and figuring things out. Others feel like the "baby steps" approach is right and take forever to graduate from riding around in parking lots to actually hitting the streets. While no single approach is going to be best for every new rider, there are a few basic things that every person who is interested in learning to ride a motorcycle should think about when they are first starting out. Update: See how the Fiesta performed against the competition in our Subcompact Showdown. 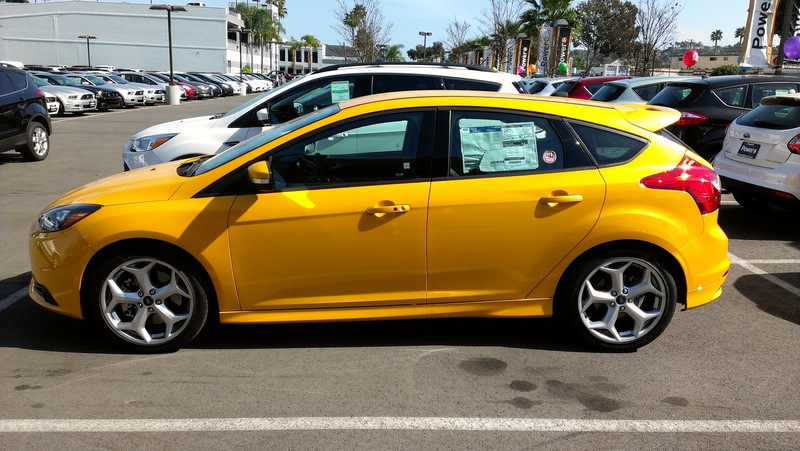 As mentioned in my review of the Ford Focus ST and the Ford Focus SE, I was not exactly the biggest fan of Ford's products. After testing the Focus ST and spending a few days with the Focus SE, my image of Ford had changed quite dramatically. Ford has made leaps and bounds in the quality of their vehicles, and I no longer feel like I am sitting in a tin can that could fall apart at any time. 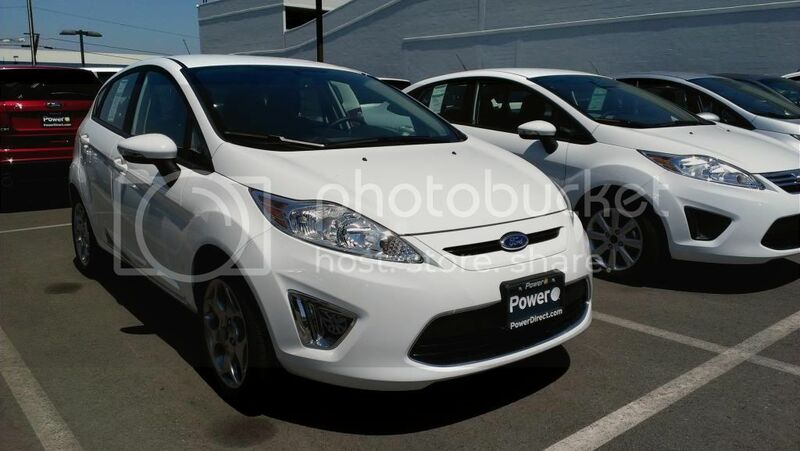 Naturally, as my fiancee and I went in to test the Ford Fiesta SES, I had fairly high hopes that this car would be able to match the two Focus variants in quality. 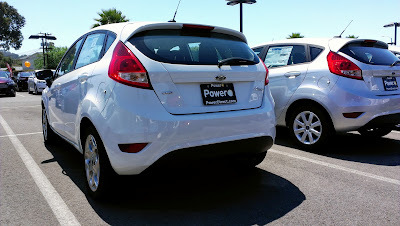 Does the Fiesta live up to the new expectation that I have of Ford's vehicles? Update: See how the Mazda2 performed against the competition in our Subcompact Showdown. In the last few years, Mazda has witnessed a resurgence. The all new Mazda6 has won the admiration of the automotive press, praising its superior driving dynamics compared to its competition. Mazda's new "Skyactiv" engine technology is also helping Mazda crawl ahead in the now ever important "fuel economy" wars. Mazda has always been viewed as sort of the quirky underdog of the Japanese automotive companies, along with fellow competitor Subaru. To date, Mazda has been the only car company to widely adopt the Wankel Rotary engine. It is this sort of quirky and pioneering spirit that has made Mazda the company it is today, with a heavier focus on driver enjoyment instead of building a mass market appliance. Though the Mazda 2 is not exactly new, it is still in its first generation here in the United States while subcompacts from the big three Japanese manufacturers have already entered their second generations. 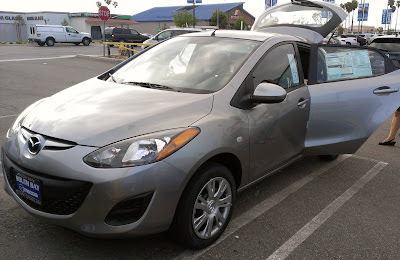 Despite its age, I had hoped to catch a glimpse of Mazda's ideology of putting driver enjoyment first with the Mazda2. My fiancee, on the other hand, was looking for a car that was enjoyable but still practical. Does the Mazda2 offer what we were both looking for? Editorial: Do we really need dealerships? The car buying process has not changed in decades. If you wanted to buy a car, you find your local dealership, negotiate with a salesperson, likely argue with them a bit, sign the paperwork and take delivery of your vehicle. This was pretty much the same regardless of buying a new or used car. Oftentimes, especially in recent years, a bit of researching online likely meant you, as the buyer, knew more about the car than the disinterested salesperson trying to sell you the car. Most dealerships, especially those that do not serve luxury car buyers, no longer place as much emphasis on training their personnel about the details of the products, instead focusing on the process of selling and convincing buyers to buy. All of this culminates in a buying process that feels rather sad and disappointing, putting a bit of a damper on what should be a pretty exciting purchase. But what if that process could be different? What if there was a way to buy a car with no pressure? What if there were people who were extraordinarily educated about the product and were able to help you answer questions that you had? What if instead of you walking into a dealership knowing more than the salesperson, you did not go to a dealership at all? What if the car you bought could be delivered to your door, fully tailored to you specifications, by a knowledgeable person who would walk you through all the details of the car? Update: See how the Fit Sport performed against the competition in our Subcompact Showdown. Starting today, we will be taking a look at a series of subcompacts currently on the market. Adding a twist to things, my fiancee joined me for these test drives and will be offering her thoughts on each car as well. 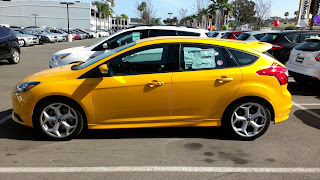 As many of you may have already read, my fiancee owns a 2011 Honda Fit Sport, so the both of us went into this test drive already familiar with the car. From what I had read about the 2013 Honda Fit Sport, the only major differences are some small cosmetic changes, new wheels, and standard steering wheel mounted controls across all models. The pre-facelifted Fit Sport was already a great car. Will these changes make it an even greater car? After spending some time with two luxury hybrids - the Lexus ES300h and the Lincoln MKZ Hybrid - albeit slightly more affordable hybrids based on technology that is derived from a less expensive platform mate, I am not totally convinced that these cars are ready for mainstream consumption. In many ways, the very idea of a hybrid is counter to the concept of luxury, which is often seen as being able to do without compromise. However, hybrid vehicles are inherently a demonstration in compromise because in the vast majority of instances, performance is sacrificed at the altar of fuel efficiency. While there are other hybrids on the market that supposedly do not give up performance, they also fail to significantly improve fuel economy. In many ways, there are simply better alternatives if you want a luxury car that still gets reasonable fuel economy. Writing the long term review for my fiancee's 2011 Honda Fit Sport got us thinking about the possibility of Honda producing an Si version of the Fit for the US market. 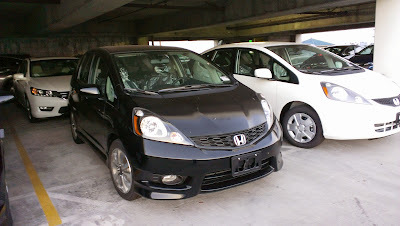 As far as we currently know, Honda has no plans to develop an Si version of the Honda Fit for the United States market. The Si version of the Fit and Jazz that do exist in other markets is more or less similar to our US Market Fit Sport, but with a smaller engine and rear disc brakes. There are those that would argue that the Fit Sport is already good enough to be considered an Si model, with its sportier suspension tuning and Sport exclusive aero parts, but it seems to be missing some things to keep it from being truly considered an Si. aftermarket. There is a fairly healthy offering of aftermarket parts available for the Honda Fit. Everything from power adders to suspension modifications are available through reputable aftermarket tuning companies. More intrepid Fit owners, and those with the financial backing, have considered swapping out the 1.5 liter L15A7 inline-4 for Honda's go to performance four-banger, the K20. At this time though, I do not know of any successful swaps with a current generation, US market Fit, though there are plenty of successful K20 swaps into the previous generation Fit. Engine swaps, cold air intakes, and suspension tuning are all great, and can add a great deal of performance to a car, but what about those that want the car to perform better out of the factory? What are enthusiasts who would rather not void their warranty to do? This is why we feel there should be a true Si version of the Fit for the US market. We want to see a Fit that is capable of doing battle with Ford's new Fiesta ST. Here is what we think a proper Fit Si should have.